Hello everyone, how are you all? Recovered from the holidays yet? I’m at university now and I have to admit, I’m quite happy about that, despite the mountains of work I have to tackle. Don’t get me wrong, I love my family and I’m grateful for everything they do, but by the time Uncle Pete had asked if I had ‘any new boyfriends’ (yes, that is boyfriends plural; apparently he’s totally cool with polygamy) and by the time an argument had ensued over a packet of crisps (they were venison flavour, surely that’s an abomination?) I was ready to go back to my everyday life. One thing I’m not ready for are the cold spells that January brings. I don’t know about you, but my hands hate winter. The skin across my knuckles and in between my fingers always gets cracked and sore, so much so that I even get tiny cuts. 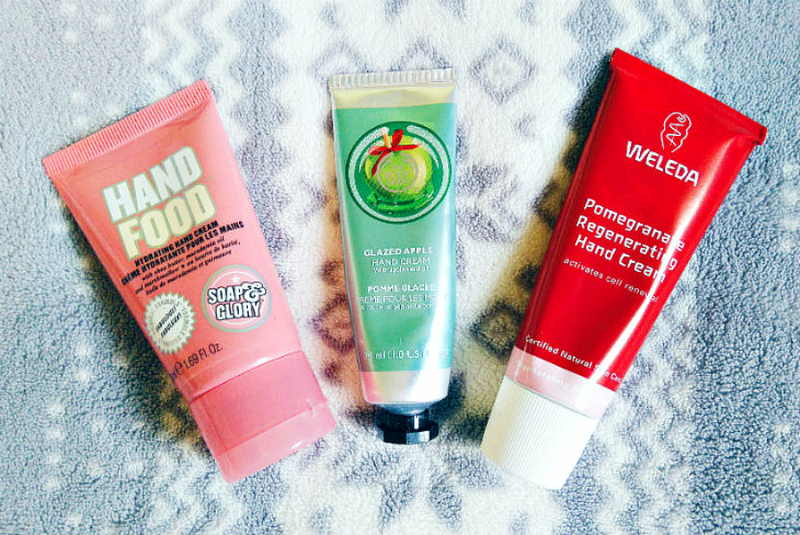 Fortunately there are plenty of hand creams to try, so I thought I’d share three of my current favourites with you. Scented with the Original Pink fragrance that Soap & Glory are perhaps most famous for, Hand Food is definitely a classic. I fell in love with it all over again after finding a travel-sized version during a clear-out and my hands are much softer and happier now I’ve started using it. Hand Food may have a buttery texture but it isn’t greasy in the slightest, and it contains shea butter, macadamia oil, and marshmellow. Imagine sour Haribo sweets: that’s this smell, but with fresh apple and a hint of vanilla mixed in. It is gorgeous — almost good enough to eat. It takes a little longer to sink in than the other creams here, but I can’t say I mind because that means the fragrance lingers (seriously, it’s my favourite thing). I save the Glazed Apple Hand Cream to use just before bed during the festive period and now the scent reminds me of being home for Christmas. After trying Weleda’s Almond Sensitive Hand Cream I knew I had to get my mum one of their hand creams for Christmas. She doesn’t like almonds, so I went for pomegranate instead. She very kindly shared her views with me for this post and even let me try a little bit herself. We agreed that the scent was fruity but not too sweet, and she liked how moisturising the cream was. I noticed that the formula is thicker than that of the Almond hand cream, but it still has that silky texture and it does sink in pretty quickly. Another winner from Weleda. What are your favourite hand creams for the winter season? And how are you finding the new year so far? Let me know in the comments!